I was recently sitting at home contemplating life while trying to fight off the flu. It seemed like the perfect opportunity to collapse in bed and watch a movie that had been in my list for a while. My criteria for adding this movie to my list was “Does it have a motorcycle on the cover? It does? OK, add it!” My expectations were that it would be an interesting documentary on road racing overall. What I got instead was so much more than that. Road is not a documentary about motorcycles. 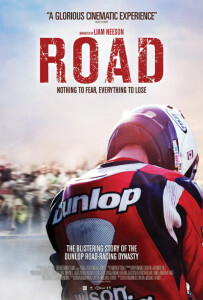 It’s a documentary about Joey and Robert Dunlop and their passion for road racing. In case you haven’t heard of them, the Dunlop brothers are two of the most successful road racers in history, having won a record number of races between them both in the Isle of Man TT and the North West 200. The film itself, narrated dramatically by Liam Neeson, is well paced and provides the highlights that you’d expect of a movie showcasing the triumphs and tragedies of the two racers. It expertly weaves the images of the older Dunlop brothers with the new generation of Dunlop racers, also brothers, both of whom are seeking to honor their father and uncle while trying to make a name for themselves on the circuits. Being a film that deals with tragedies on the racecourse, you get your fair share of crash reel. However, in contrast to other movies that gratuitously feature accidents, Road‘s presentation is sparse and respectful when used. It masterfully builds up the tension leading to one of these events and then it’s over as quickly as though it were happening live. No repetitions. No slow-mo. In doing so, it not only saves the film from becoming a morbid spectacle but it also illustrates the true nature of what an accident is actually like. The documentary also deals heavily with the subject of loss and how people handle it differently. The Dunlop dynasty has had its fair share of tragedy throughout its history, but each generation retains its desire to keep pursuing their passion in spite of everything. This element gives the movie a lot of heart and was something I was not expecting to see. It humanized a movie that I thought was going to be a nonstop engine-fest. Overall it’s an exceptional film that brilliantly captures the thrill of motorcycle racing on some of the world’s most difficult tracks but it focuses mainly on the personal story of the Dunlops. You’ll cheer for them and weep with them. This is one that will tug at your heartstrings. You can watch Road on Netflix or buy it on Amazon (but keep in mind that it’s a Region 2 DVD). Luis is just an ordinary guy who happens to love traveling on motorcycles. When he's not revving his bike's engine, he's writing about motorcycle travel and helping people find the best motorcycle gear that will make their trips more comfortable and enjoyable.